It doesn't get better than dating a baker. Growing up I never had sweets, we were not really a dessert family. So now, getting to eat something like a cookie, is a special treat. A basic cookie from a store is a delight for me, but Katie's baking is on a whole different level. She uses real ingredients, and loves to combine flavors. 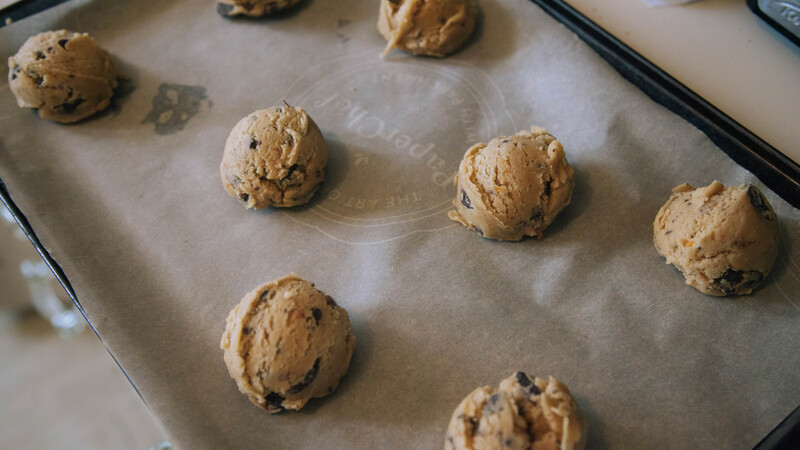 For these cookies, she combined orange, chocolate chunks and a hint of lavender. As I'm new to food photography, this was another challenging shoot. Mostly due to our limitations on "set items". Cool plates, decorative textures, wood blocks, etc. I'm learning that set design is 70-80% of a good food photograph. The other 30% is light. Natural, comfortable daylight seems to work best. Making food seem warm and appetizing. But occasionally, some harsh shadows can really bring out the texture of a cookie, or an old cookie sheet. By far, my favorite part of my side job of food photography, is getting to taste the results. These cookies are amazing, and you can check out the recipe for them at Katie's site Margaret Moon Baking!